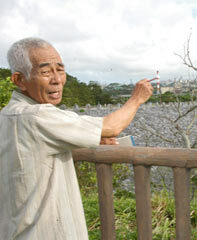 Masao Nakasone talked of the confusion in those days when many residents complained of sore throats and eyes, near the Chibana Depot, in Kurashiki, Okinawa City. On July 15, 40 years passed since phase II of the Red Hat Operation in which 13000 tons of poison gas munitions, including Mustard, Sarin and VX were removed from Okinawa to Johnston Island in the North Pacific Ocean. Residents never knew that these munitions had been stored in the U.S. Army Ammunition Depot Chibana. People living near the transfer passage from the Chibana Depot to Tengan Military Pier in Uruma City were evacuated for about two months until September 9, 1971 when the second round of transport was complete and lived lives of anxiety next to stocks of chemical weapons. On December 3, 1970, an accident occurred in which employees complained of pain in their eyes and throats, and someone in the guard tower at Zukeyama Dam (now Kurashiki Dam) confirmed that white smoke was seen rising from the ammunition depot. This was just two days before the government announced phase I of the operation to transport the poison gas munitions. “Has poison gas leaked?” 72 year-old Masao Nakasone, a member of the task force for residents of the Noborikawa district, shared his experience in those tense days. He said that while the U.S. military denied that there had been an accident involving poison gas, the residents were filled with anxiety and suspicion in the time ahead of the operation. The U.S. military confirmed its poison gas storage in Okinawa for the first time after the Wall Street Journal reported that there had been a nerve gas leak at the Chibana Ammunition Depot in 1969. A report written by Government of the Ryukyu investigators in 1971 speculated that since residents complained of eye pain, skin irritation, coughing and because of the inexplicable withering of plants people living near the bases from the 1960s were exposed to chemical weapons. Nakasone is now editing a book on the history of the Noborikawa district in an attempt to prevent the facts of how the area was shrouded in fear in those days wearing thin.